Hola. We're trying something new today. 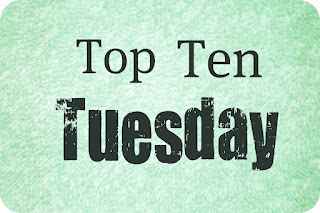 Top Ten Tuesdays is a weekly meme hosted at The Broke and The Bookish. Basically, you create a list tailored to the week's topic and share it with other readers by linking up at The Broke and The Bookish. You can find out more information here. I read the The Girl with the Dragon Tattoo and....it was okay. It kind of bored me. I tried the audiobook of the second book and it bored me as well. Just not for me I guess. I've read the first two books: Devil in a Blue Dress and A Red Death. I just haven't gotten around to the others. It's a good series. I was introduced to it through a reading challenge. It's a cross between "private eye" adventures and social commentary. Very interesting. Another instance where I just haven't gotten around to finishing it. I've read A Wizard Earthsea. It's a really good young adult fantasy series. I love Le Guin's writing, so I'd recommend it to just about anyone. I feel like I don't need to explain why I haven't finished this series yet. The books are so long! Very good. But very lengthy reads. I've only read A Game of Thrones. I started A Clash of Kings and I'm a little over halfway through. Okay, so I only have five, the majority of which I've started in the past year. I haven't started the Song of Ice and Fire books because they are so long, I just can't commit! That said, I've heard nothing but good things about them. Great list! I am determined to open the third book in that series before the end of the year.